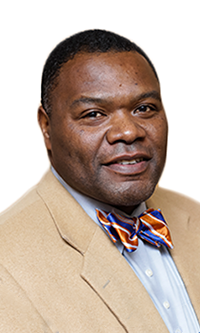 A native of Chattanooga, Tennessee, Darryl D. Thompson has over 27 years in education between the Kentucky Department of Education, Franklin County Public Schools, and Fayette County Publics Schools. He currently serves as the Equity Officer for Fayette County Public Schools, Office of Equity, School Support, and Community Engagement. In this capacity, he provides technical assistance and guidance in districtwide initiatives in support of educational equity: Novice Reduction and Closing the Achievement Gap; Minority Recruitment and Employee Retention; School Based Decision Making (SBDM); Minority and Women-owned Business Enterprises (supplier diversity); Family and Community Engagement; Student Placement and Accommodations; and most recently authored a grant through the William R. Kenan, Jr. Charitable Trust that allowed FCPS to implement the R.E.A.L. Men Read comprehensive literacy and mentoring program to support historically underperforming students /boys of color. Darryl is married to Faith E. Thompson, a career educator. Both are graduates of Kentucky State University. Darryl received his B.A. in English, and a minor in Criminal Justice. They have two children, Emory Darryl Thompson (graduating senior at Darmouth College) and E’mori Faith Thompson (rising 8th Grader at Beaumont Middle School).